At a certain point of our lives, we thought that our souls were lost. Whether we realized or not, there were some moments in our lives, the life-changing moments, that made us felt like we were already dead. It took away our souls just like that. And it could either take us to a bitter afterlife in life, or change us in some ways. Those moments, perhaps could be the death of someone so precious for us, could be the lost of the love of our lives, could be everything in form of loss and grief. When everything was a part of a grand plan of destiny, then why did we live, wake up and breathe every single day? People said that it’s to make a mistake. And a mistake existed to make people learn. That’s why we live. Because nothing lasts forever, so are loss and grief. There would come a day when we were be able to find ourselves again, and that, perhaps could be the moment when we found love. Life breaks us. People are broken by life. Afterward, some are stronger at broken places. Some are able to change the bitter afterlife into a wonderful ones. And in the moment that we are able to feel love again, we also find the power to face our past, which isn’t pretty at all. The road to that is never easy. However, as long as we understand the importance of human soul, I believe that we can make it. Well, there’s no gain without pain, right? As a human, we live our every single day without knowing what tomorrow will bring. And all we can do is making the most out of every moment we have today. Moreover, when we already found the precious one, we must live our every single day by making the most out of every shared moment we can have now. Life is full of surprises, even at the most unpredictable moment. So, when you feel so lost and life feels so meaningless, take a grip, because someday you will find the reason behind anything and how you’re meant for life, or someone, or even yourself. Today’s movie, and also the second movie for Lost and Found, is an American romantic comedy fantasy film titled “Just Like Heaven”. This movie tells about a love story of Elizabeth Masterson (portrayed by Reese Witherspoon) and David Abbott (portrayed by Mark Ruffalo). Elizabeth is a young emergency medicine physician whose work is her whole life. She is still single in her late 20s, and pulls 26-hours shifts in the emergency room. Her friends, and even her own sister, Abby Brody (Dina Waters), despair of her unmarried status and want to fix her up. However, she gets in a serious car accident while on her way to a blind date. Three months later, David moves into the apartment that had been Elizabeth’s, after discovering the place in what seems to be a fateful happenstance. He was a landscape garden architect, until two years ago when his wife died suddenly. Apparently, he’s still recovering from it. Elizabeth’s spirit begins to appear in front of David in the apartment with ghostly properties and abilities that make it clear that something is not right. She can suddenly appear and disappear, walk or move through walls and objects, and once takes over his actions. When they meet, they are both surprised, as Elizabeth is not aware yet of her recent history and refuses to think she is dead. Confused at first, but David is fast in grabbing the situation as he seeks for a help from Darryl (Jon Heder), a psychic bookstore clerk. Darryl can feel Elizabeth’s spirit though he can’t see her. With his assistance, David and Elizabeth find out who she is, what happened to her, and why they are connected. Apparently she is not dead, but in a coma. Her body being kept on life support at the hospital where she used to work. As they spend their times together, David finds himself falling for Elizabeth, and so is she. Therefore, he asks his best friend, Jack (Donal Logue), to help him saving her. But who knows, that it turns out that the reason David can see Elizabeth is that they were meant to meet. Watching “Just Like Heaven” makes me think about one thing; the final destination of life is indeed death, however, do people live the life just to wait for death? Somehow, watching this movie makes me sure that life is too short to waste it away. Because we never know what tomorrow brings, and because life and death apparently have a very close distance. We could be dead tomorrow, or maybe in the next hour, or minutes, or seconds, we never know. As we live, we should make the best out of it. At least we can do is doing things we are passionate about, then I believe that this life we live wouldn’t be in vain. Yet apparently, doing things we love to do isn’t enough. I note what Fran says about Elizabeth: “It would have been so awful if she’d gone through her whole life not knowing what it was all about.” The fact that we’re living now, as who we are, is a part of a grand master plan, I believe that. There are some purposes behind all of this; some we haven’t figured it out yet, some we may never figured out until our last breath in this life. Anyway it is, we live to search for it, to explore, not only things we love and are best at, but also things we may love and be best at. We should never hesitate to get out from our comfort zones and open our hearts and minds to all possibilities and chances that we might have missed. Jack says to David, as he can’t stand seeing his lifeless best friend: “Look around you, see this? This is the world, join it! Stop swimming around in your own mind. That is a dangerous neighborhood that you should not go into alone.” It’s alright to be sad when you lose someone so precious, your other half, your soulmate. It’s alright to feel disappointed with life when it seems so unfair, cruel, and unfriendly. It’s okay to be not okay. However, don’t grieve. Somehow, watching this movie makes me sure that life is too short to spend it in a grief. Everything happens for a reason; I know it’s easy to say yet in fact it’s hard to be well received, but, as we live, as we still breathe, we have to move on. Because life doesn’t wait. It keeps moving forward. And who knows, while we’re drowning in grief, our soulmate is waiting out there in the corner of the street? Nobody knows. And I believe, soulmate has more than one faces. When you lose one, you will find another one. Nobody says it would be easy though. Everything needs a process. Moving on and being able to fall in love again need a process. Eventually, lonely people meet and fall in love. And life always has its own power to deliver a heartfelt destiny in a funny way. This is what I take from the story of Elizabeth and David. From Elizabeth’s point of view, life is lonesome. It gave her everything but a love life. From David’s point of view, life is ruthless. It took away the love of his life. The universe conspires to meet up the two. David comes into Elizabeth’s (after)life, complete it, fill it with the love she has been missing. Elizabeth comes into David’s life, fix it, fill it with the spirit he has been losing. They complete each other, fix and heal. Well yeah, love comes at the most unexpected time, sometimes, and in the most unexpected place. The certain thing is, it takes courage and strong will to open up our hearts for it. The last thing I note from “Just Like Heaven”, and as I always say about a heartfelt romantic comedy film, it has a great chemistry from the main cast couple. 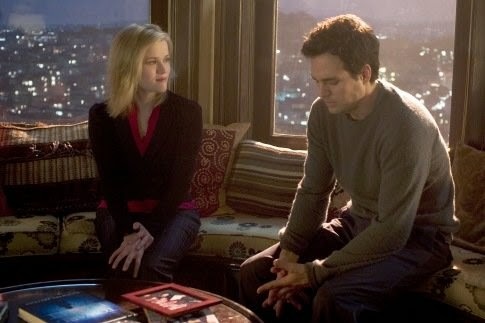 In this case, the production team’s choice to put together Reese Witherspoon and Mark Ruffalo was a brilliant idea. Witherspoon, I always think that she’s not that pretty, well, in compare to other actresses in her age like Kate Hudson or Liv Tyler, but I always think that she has the ability to exude some kind of down-to-Earth charms, which is very great of her. And the same vibe goes with Ruffalo. He’s not that handsome, not that tall, not that man-with-a-great-body kind of actor, yet he has this mysterious charm that could draw people in. Therefore, despite the fantasy storyline this movie has, Witherspoon and Ruffalo could live up their characters realistically. Moreover, the rest of supporting cast also deserve a special credit in here, for showing a great performance that boost the mood in this movie. The title of this film is also that of a popular 1987 song, “Just Like Heaven” by The Cure. The song is played over the closing credits, as well as a cover version by Katie Melua, which is specially recorded for the soundtrack of the movie. This movie is based on the novel titled “If Only It Were True (Et si c'était vrai...)”, written by Marc Levy. It was the first novel by the French author which was first published in 1999. It was translated into English in 2000 and Steven Spielberg acquired the rights to make the film out of the book. I have to say, the using of the song is so perfect in this movie. It suits well with the storyline, and apparently the title suits well too. It’s a great choice rather than using the same title with the novel. Especially Melua’s cover version, it brings the heartwarming atmosphere during the opening titles. Well, I think that one word ‘heartwarming’ is perfect to sum up the whole movie, as it could give a warm feeling for those lost souls.